Fourth installment by sociologist Dave Horton, from Lancaster University, as a guest writer. Dave has written a brilliant assessment of Fear of Cycling in an essay and we're well pleased that he fancies the idea of a collaboration. We'll be presenting Dave's essay in five parts. We might suppose that fear of cycling has become locked into a downward spiral from which it seems almost impossible to break, unless the practice of cycling can be spatially relocated, and performed under ‘new’, ‘safe’ conditions. This section examines recent attempts to create such new, safe cycling spaces. For most of the twentieth century, the great majority of cycling in the UK took place on roads. The dominant, widely shared assumption was that (declining numbers of) cyclists shared space with (increasing numbers of) cars, trucks, buses and taxis. Riding in an environment dominated by potentially lethal motorised modes of mobility was a taken-for-granted, normal part of cyclists’ ordinary experience. But over the last decade or so, a fundamental shift in cycling policy and infrastructure has occurred. Cycle lanes have been introduced across the length and breadth of Britain. Many cycle lanes are ‘on-road’; the use of white lines and coloured paint is intended to mark a boundary between space for motorised traffic and space for cyclists. Although often criticised and sometimes ridiculed, at its best this infrastructure aims to make cycling journeys more attractive; quicker, easier, safer, more pleasant. In the UK, recent years have also seen major development of off-road cycling routes, shared not with motorised traffic but with people walking, dogs and horses (for details, see Cotton 2004). Many such routes have been developed and promoted by Sustrans, a charitable organisation committed to encouraging sustainable transport (see Sustrans 2000; www.sustrans.org.uk). These routes are emerging most explicitly around the figure of the cyclist, and they have certainly boosted interest and participation in cycling (Peace 2004; Sustrans 2006). However, an unintended consequence of their popularity may be that the dominant public perception of cycling is becoming of an activity which best occurs in ‘safe’ and pleasant places (on disagreements around this issue within cycling policy circles, see Rosen 2003; Jones 2004). ‘Normal’ roads are no place to cycle; they are to be feared. It is worth noting here the long-standing contentiousness, among British cyclists' organisations, of off-road cycling routes. The decades spanning the middle of the twentieth century saw British roads struggling to accommodate the car and the bicycle harmoniously. A pamphlet produced by the Cyclists' Touring Club and titled Road Safety: a fair and sound policy (CTC n.d.b[c.1935]) states: 'It is often said that there is not room on our present roads for everybody and so the cyclist should be removed. The only traffic that cannot safely use our present roads is high-speed motor traffic, for which special highways should be provided'. In the ensuing battles over which group of users should be 'pushed off' the roads, cyclists eventually 'won', with the development of the motorway network for which they had long campaigned. It is impossible to escape the conclusion that most people and organisations who advocate cycle paths are not actuated by motives of benevolence or sympathy, although they may declare that their sole concern is the welfare of the cyclist ... A great deal of the cycle-path propaganda is based on a desire to remove cyclists from the roads. That is why the request for cycle paths is so often accompanied by a suggestion that their use should be enforced by law. Therein lies a serious threat to cycling. Of course the situation today is different. Perhaps most obviously, many people who fear cycling on the roads apparently desire to cycle elsewhere. Unsurprisingly, forms of off-road cycling - not only leisure cycling on ‘traffic free’ routes, but also BMX, mountain biking, cyclo-cross, trials riding and track - all seem to be gaining in popularity. And with the expansion of places to cycle off-road, the expectation grows that such places are the places to cycle. The road stops feeling like a place to cycle; it begins to feel as though cycling does not belong there. The institutionalisation of this sensibility, anticipated by cyclists 70 years ago, is potentially not far behind. In 2006, the draft of the revised Highway Code instructed cyclists to use off-road routes wherever they exist. These planned revisions were opposed by cyclists, led by CTC, but they nonetheless make clear how the provision of ‘attractive’ alternatives produces the cyclist-on-the-road as ever more out-of-place. New ideas of ‘normal’ are being produced, and it is becoming less normal to see roads as appropriate places to cycle. Meanwhile, riding on the road becomes an ever more fearful prospect for ever more people. Without any necessary objective change in the conditions prevailing on the roads, the provision of off-road routes increases people's fear of on-road cycling. Further, the promotion of such routes tends to feed (on) this fear. Sustrans’ publicity material, for example, makes regular use of an adjective which has assumed enormous power in UK cycling promotion; ‘safe’. One recruitment leaflet calls on people to ‘help us build safe attractive cycle routes in your area’ (Sustrans n.d., my emphases). Arguably therefore, today’s youngsters are growing up with the expectation that, if they cycle at all, it will be away from cars. It would of course be wrong to see these shifting sensibilities as unopposed. Cycling advocates are increasingly insistent that today’s youngsters must be trained to ride on the roads, and government funding towards that aim has recently been forthcoming. But tensions around the proper place of cycling constitute a major new battleground of mobility and sustainability conflicts in the twenty first century. It is also worth noting, for what is to follow, that spatial re-allocation of cycling away from the road is shifting the object of fear, from cycling to the cyclist. On off-road routes, the cyclist is no longer so viscerally threatened and endangered, and instead becomes perceived as the source of threat and danger to slower-moving, more leisurely others. The source of fear shifts from the practice to the practitioner. Before continuing on the theme of fear of the cyclist, I want briefly to summarise this section. The road safety industry, helmet promotion campaigns and anyone responsible for marketing off-road cycling facilities all have a vested interest in constructing cycling - particularly cycling on the road - as a dangerous practice. Cycling, in other words, is made ‘dangerous’ by these attempts to render it ‘safe’. Each of the cases I have discussed is (perhaps unwittingly) therefore implicated in the production of a fear of cycling. This fear of cycling stops people cycling, and stopping people from cycling is an effective way of continuing the reproduction of a fear of cycling. But now I want to tackle more directly something at which up until now I have only been hinting, the potential relevance of a fear of the cyclist to a fear of cycling. 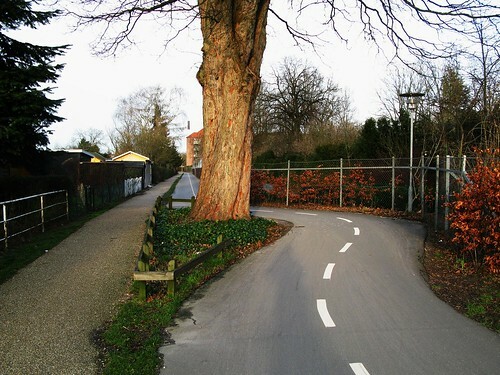 - Cotton, N. (2004) Traffic-Free Cycle Trails (Frome: CycleCity Guides). - Cyclists' Touring Club (n.d. b [c.1935]) Road Safety: a fair and sound policy (London: Cyclists' Touring Club). - Cyclists' Touring Club (1937) Making the Roads Safe: The Cyclists Point of View (London: Cyclists' Touring Club). - Jones, T. (2004) ‘Household Travel Behaviour Adjacent to the National Cycle Network: the Network's Role in Encouraging Utility Cycling', paper presented to Cycling and the Social Sciences Symposium, Centre for Mobilities Research, Lancaster University. - Peace, R. (2004) 'Damned Lies and Statistics', in Cycle, August/September, 20-2. - Rosen, P. (2003) How Can Research into Cycling Help Implement the National Cycling Strategy? Review of Cycling Research Findings and Needs, (University of York: Science and Technology Studies Unit). - Sustrans (2000) Millennium Miles: The Story of the National Cycle Network, (Wilts: Good Books). - Sustrans (2006) The National Cycle Network: Route User Monitoring Report To End of 2005 (Bristol: Sustrans). - Sustrans (n.d.) Help us build safe attractive cycle routes in your area (Bristol: Sustrans). Dave Horton is a sociologist and lover of all things cycling. He is part of the Cycling and Society Research Group, which has pioneered a ‘cultural turn’ in cycling studies and which holds an annual symposium in the UK. Dave works at Lancaster Environment Centre, Lancaster University, on the project ‘Understanding Walking and Cycling’. He tries to do, to write about, and to promote all kinds of cycling, because cycling is essentially good.